In an article published in the April issue of The Journal of Nuclear Medicine, researchers at Stanford University in California provide a template for assessing new positron emission tomography (PET) radiotracers that can accurately identify molecules in cancer cells that prevent the immune system from attacking the cancer. A drug that blocks a cancer's inhibitory checkpoint molecules is called an immune checkpoint inhibitor and this form of immunotherapy has emerged as a promising cancer treatment approach. However, the lack of imaging tools to assess immune checkpoint expression has been a major barrier to predicting and monitoring response to a clinical checkpoint blockade. "Because immunotherapies for cancer are expanding, methods to optimize them for an individual patient through molecular imaging are needed," explains Sam Gambhir, MD, PhD, at Stanford University. "Using animal models, this study shows the development of several new engineered PET tracers that can help image the immune system in action and be used to monitor checkpoint inhibitor therapy." 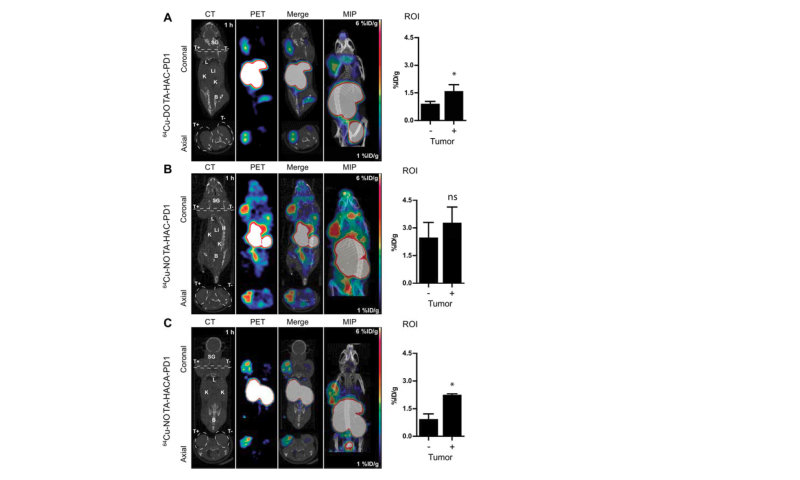 The study assessed practical immunoPET radiotracer design modifications and their effects onhuman PD-L1 immune checkpoint imaging. The researchers sought to optimize engineering design parameters including chelate, glycosylation, and radiometal to develop a non-invasive molecular imaging tool for eventual monitoring of clinical checkpoint blockade. Gambhir points out, "This research will ultimately allow for translation to human imaging of the tracer that worked best in animal models. An effective immunoPET tracer will help patients receiving checkpoint inhibitor immunotherapy get optimal treatment and have the best chance for fighting their cancer." Molecular imaging is playing an increasingly integral role in immunotherapy and personalized medicine. Looking ahead, Gambhir envisions "a lot more use of PET/CT or PET/MR imaging for patients undergoing immunotherapy." He adds, "This and related research will also help us develop other imaging approaches for understanding the immune system in action."